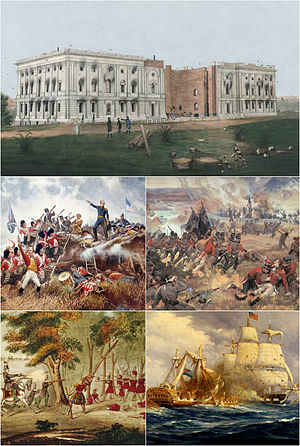 Clockwise frae tap: damage tae the U.S. Capitol efter the Burnin o Washington; the mortally woondit Isaac Brock spurs on the York Volunteers at the battle o Queenston Heights; USS Constitution vs HMS Guerriere; The daith o Tecumseh in 1813 ends the Indian airmed struggle in the American Midwest; Andrew Jackson defeats the Breetish assault on New Orleans. * Some militias operatit in anly thair ain regions. ‡ A locally raised coastal pertection an seminaval force on the Great Lochs. The War o 1812 wis a militar conflict that lastit frae Juin 18, 1812, tae Februar 18, 1815, focht atween the Unitit States o Americae an the Unitit Kinrick, its North American colonies, an its North American Indian allies. ↑ Battle of the Thames, Encyclopædia Britannica, Many British troops were captured and Tecumseh was killed, destroying his Indian alliance and breaking the Indian power in the Ohio and Indiana territories. After this battle, most of the tribes abandoned their association with the British. ↑ Allen 1996, p. 121. This page wis last eeditit on 21 Juin 2016, at 21:13.